Until the 1970s, angina pectoris had been uniformly explained by an increase in myocardial oxygen consumption induced by exertion in the presence of organic stenosis due to atherosclerosis in the coronary artery, resulting in relative myocardial oxygen deficiency. Consequently, beta-blockers have been widely introduced for the treatment of angina pectoris. 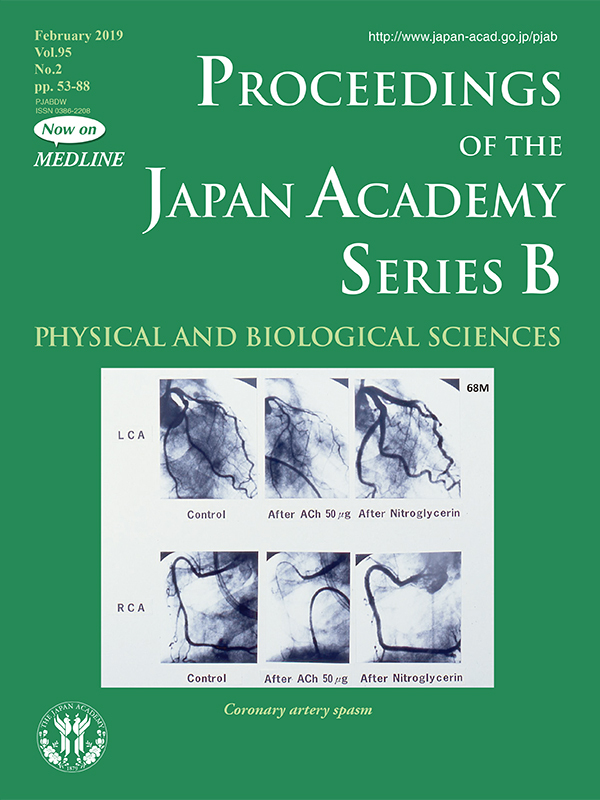 However, angina pectoris at rest (particularly during the night and early morning) is common —especially in Japan— and its cause remained unknown for many years. Dr. Yasue and his coworkers were the first to prove that angina at rest is caused by coronary (artery) spasm (CAS) by performing coronary angiography during attacks induced systematically either by methacholine injection or exercise early in the morning.1)-2) They then established intracoronary acetylcholine infusion as a diagnostic test for CAS (as shown in the cover figures). Dr. Yasue and colleagues further clarified the clinical features of CAS. CAS can occur in the coronary arteries with or without organic stenosis and in one coronary artery or two or three arteries (multi-vessel spasm). CAS may also trigger acute myocardial infarction, with multi-vessel spasm resulting in a risk of sudden death. Dr. Yasue’s research on the pathophysiology of CAS has developed over many years. He and his coworkers demonstrated that oxidative stress, endothelial dysfunction, and low-grade chronic inflammation all play important roles in CAS pathogenesis, leading to increased coronary smooth muscle Ca2+ sensitivity through RhoA/ROCK activation and resultant hypercontraction. CAS is most prevalent among East Asians and is associated with the aldehyde dehydrogenase 2 (ALDH 2)-deficient genotype (ALDH 2*2) and alcohol flushing, which is also prevalent among the East Asians but virtually non-existent in other populations. A series of studies on aldehyde is currently attracting great attention. Clinical risk factors for CAS have been characterized as cigarette smoking and genetic polymorphisms, such as ALDH 2 cited above and endothelial nitric oxide synthase genotypes. Of note, the risk factors for CAS differ somewhat from those of angina pectoris due to organic stenosis. Regarding the treatment of CAS, Dr. Yasue and colleagues found that Ca-channel blockers that block the intracellular entry of Ca2+ are markedly effective for CAS. It was also reported that statins are useful for the treatment of CAS. The contributions of Dr. Yasue and his coworkers to the study of CAS are remarkable, as described in this issue (pp. 53-66), and have saved the lives of many patients suffering from CAS. The diagnosis of CAS is not necessarily easy, but their work helps us keep it in mind. 1) Yasue H. et al. (1974) Role of autonomic nervous system in the pathogenesis of Prinzmetal's variant form of angina. Circulation 50, 534-539. 2) Yasue H. et al. (1976) Prinzmetal's variant form of angina as a manifestation of alpha-adrenergic receptor-mediated coronary artery spasm: documentation by coronary arteriography Am. Heart J. 91, 148-155.